GFC FC AFC Black Creek Deacon "Dee" x NAGDC GAFC FC AFC High Hopes Little Ann "Annie"
We couldn't be more excited about the breeding of these outstanding bird dogs. Dee brings independence, stamina and speed. Annie brings a snappy run, long nose and exceptional point. Both of these dogs pointed early and often and both finished their Field Champion titles before they turned 5. This is going to be a hard hitting, high energy breeding. The litter will be American Kennel Club (AKC) and American Field (AF) registered and futurity nominated. These two dogs are hot and we expect the pups to be fast, big running, hard hitting bird dogs. That said, Annie and Dee have the classic Brittany temperament and the pups must have the opportunity to bond with a family. Dee is owned by Ron Harling of the prestigious "Black Creek Kennel" in upstate New York. The Harlings have been involved in Brittanys for more than 50 years and have owned and bred some of the finest Brittanys in the nation. 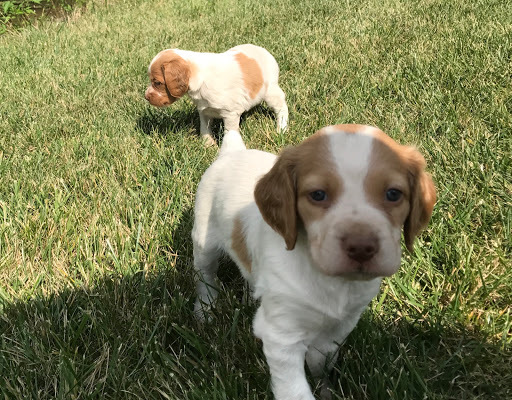 Dee is a big-running all age Brittany handled by professional trainer Chad Holman of Holman Kennels in Whittington, Illinois. Throughout his field trial career, Dee has traveled across the country, competing against the best of the best, making his lengthy record of field trial wins and placements all the more impressive. You'll note the extraordinary accomplishments of the dogs on this pedigree. Hall of Fame dogs appear in both pedigrees, however this breeding is an outcross of two outstanding dogs. We're excited about this litter because we think the conformation, running style and extreme point of these two dogs will compliment each other and produce fast, intelligent, hard-hitting bird dogs with endurance and a whole lot of point.